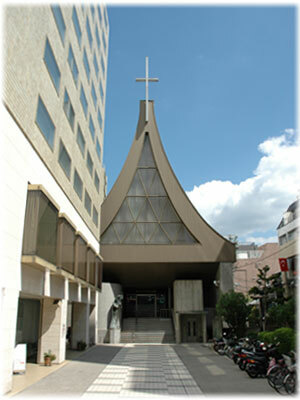 The Kawaramachi Church is also called "St. Francis Xavier Cathedral.” St. Francis Xavier, one of the missionaries who first introduced Christianity to Japan is the patron saint of the church. 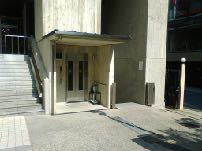 There is a reception desk on the left side of the courtyard as you enter the church compound from the front gate. If you have any questions when you come for the first time, please ask there. In addition, we have an AED machine there, so please call out for it in case of a medical emergency. 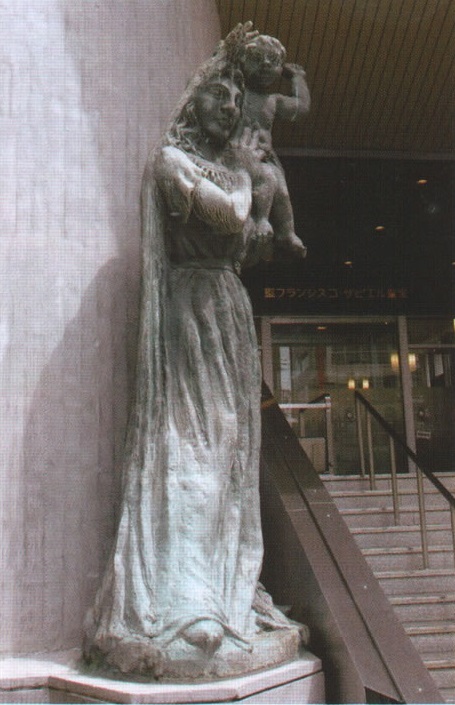 The bronze statue of the Madonna and Child at the entrance of the cathedral was created by the sculptor Kinouchi Yoshi in 1972. The church is 4 rows of pews in width and 20 rows in length. The pews are wooden and movable. 440 people can be seated at one time. We also have a hearing aid system, so if you wish to use it, please contact a receptionist at the reception desk of the cathedral for help. 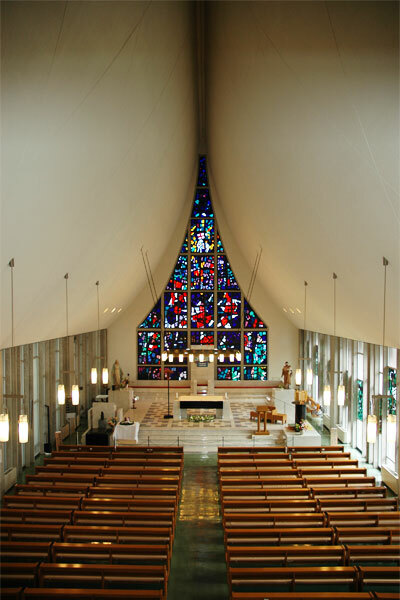 The cathedral was designed by a Swiss priest, the Rev. Froiler. The church is 43 meters in length (east to west) and 15.4 meters in width (north to south.) The height of the roof is 24 meters. 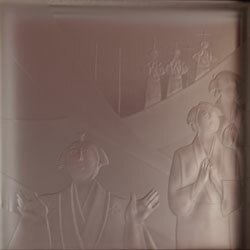 The roof design incorporates the ancient Japanese shrine style. 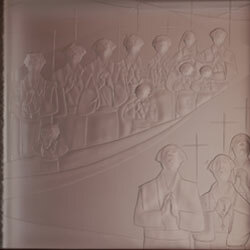 In the back of the cathedral to the left side as you enter, there is a small prayer room that is dedicated to the 52 Kyoto martyrs from among the the 187 martyrs of Japan who were beatified, declared “Blessed”, by the Catholic church in Nagasaki in 2008. 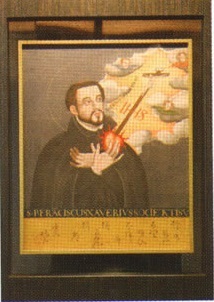 There are also an official reproduction of the "St. Francis Xavier Statue", a glass etched picture (circa in 1987) showing Lazarus resurrected, a picture of “The Great Martyrdom of Kyoto" in 1619, and the statue of Our Lady of Fatima. 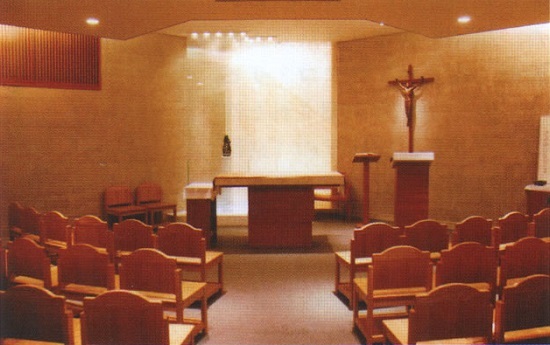 The confessional is on the right side of that room as you enter. In the cathedral you can see the stained glass windows of Hans Stocker of Switzerland on the righthand side as you enter. 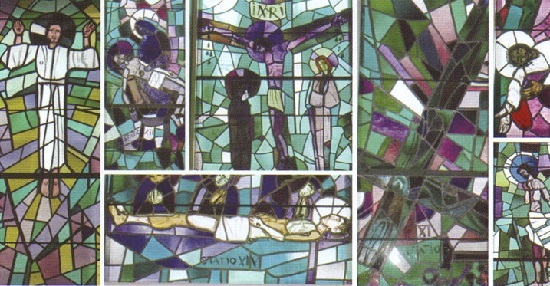 The first window frame on your right as you enter the church depicts the Archan-gel Michael followed by the image of the church's patron saint, Saint Francis Xavier. 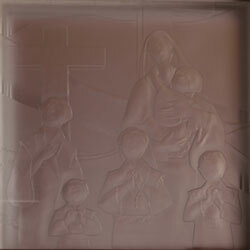 Thereafter are frames depicting various Stations of the Cross, all on the right side of the church as you enter. The altar, the lectern, the sanctuary, the wall behind the bishop's chair, the seats of the inner sanctum and the floor are all made of marble. What you see above the bishop's seat behind the altar is the Crest of the Bishop of the Kyoto Diocese. The main cross has on it the Greek letters Α (alpha) and Ω (omega), the ship crossing the world's rough waves is led by the Hope Star, the miter shaped hat and staff of the bishop form the mast and sails of the ship which guide it, and four crosses representing the four prefectures (Kyoto, Shiga, Nara, Mie) that make up the Kyoto Diocese. 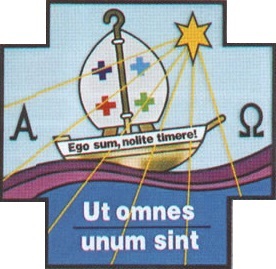 On the hull of the ship are the words "I am not afraid" and the lower part shows the bishops' motto "That all may be one",both written in Latin. 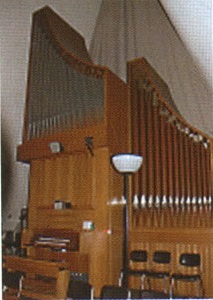 On the second floor balcony at the back of the cathedral, there is a pipe organ. It was designed and manufactured by the Bosch Company of Germany and was installed in February of 1971. There is a basement entrance that you can enter which is to the right of the main stairs.The wheelchair-bound can use the elevator that is between the stairs to the main entrance and the stairs going to the basement. Basement and "Our Lady of the Capital"
In 1847, when Father Leon Lobin, who was the head priest of a church in a small village in Eastern France, learned about the spectacular martyrdom history in Japan, he started a local "movement to pray for the restoration of the church in Japan", but when this call was made it spread beyond his village and became a big movement throughout France. 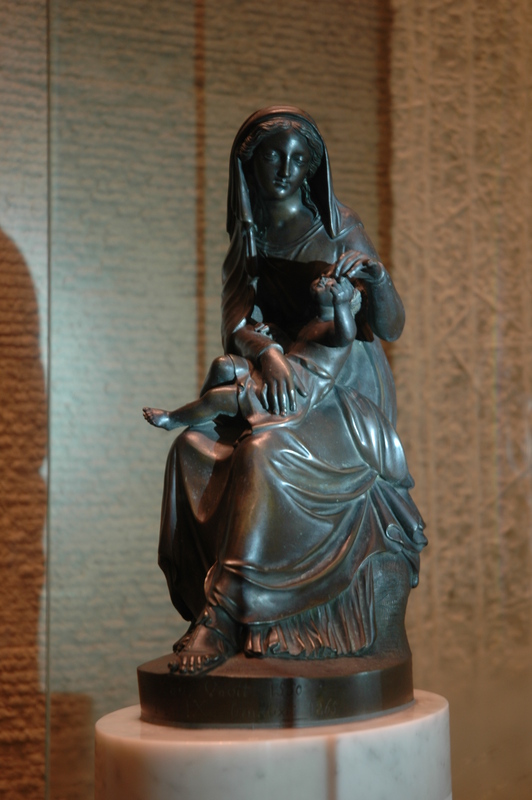 In 1865 a teacher received a commission to make a bronze statue of the Madonna for the church in the Japanese capital by Pope Pius IX in order to fulfill Xavier's wish and it was christened "Our Lady of the Capital City" (Notre Dame de Miyako). 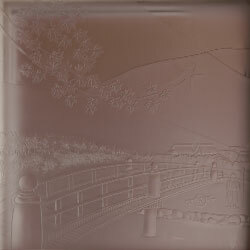 It was entrusted to the French foreign mission to be set up on a hill overlooking Kyoto. 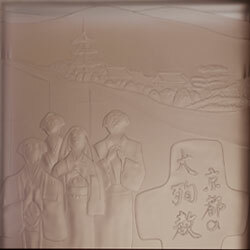 But sometime after it ar-rived in Kyoto it was buried in the Shogun's mound in Higashiyama by a Father Vigreux to preserve it from anti-Christian ordinances. It wasn’t until 1879 that it was excavated by the hand of Father Virion who had been assigned to Kyoto as a missionary. From that time un-til 2004, this statue had been carefully preserved at the Kawaramachi Church, but then it was moved to a newly established church dedicated to "Our Lady of the Capital City."